MAPS Final Report on its work "Ensuring Safety at Transitions of Care" is available now! “You: Your Own Best Medicine” was a campaign sponsored by the Minnesota Alliance for Patient Safety (MAPS) to empower health care patients to actively manage their own health care. A focus of the project was to assist Minnesotans partnering with their health care teams to stay healthy and safe. The MAPS campaign was conducted with funding from the Center for Medicare & Medicaid Innovation (CMMI) under an expansion of the grant received by the Minnesota Hospital Association (MHA) Leading Edge Advanced Practice Topics (LEAPT). Although the terminology most often used throughout the report references patients, the campaign also involved residents and consumers. This report highlights the background, process, findings and next steps regarding the grant. The timeline for the grant was October 2013 through December 8, 2014 with an award of roughly $500,000. The project began with patient research. Using the patient research findings, MAPS designed a patient packet which was distributed to 1000 patients in 12 pilot organizations. To supplement the packet, a communications campaign was added. The project was evaluated through a 25 question survey. Sustainability will be accomplished through the website www.ownbestmedicine.mn, additional packets, as well as smart phone and tablet apps. The ownbestmedicine campaign has been running ads in local newspapers this fall. Click here to see an ad that has been in the Minneapolis Star Tribune recently! In October, at MAPS' Patient Safety Conference, MAPS' Executive Director, Marie Dotseth gave a presentation on the grant work to date, focusing on lessons learned. Click below to see the presentation. 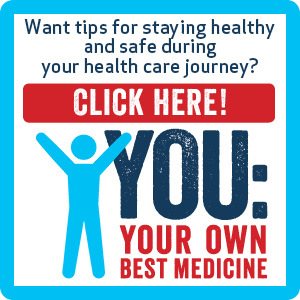 Marie Dotseth - "Ensuring Safety at Transitions of Care: Lessons from Consumer Research and Pilot Testing"
Click below to listen to the ownbestmedicine ad that is playing on MPR this fall! Click on the graphic below to visit the ownbestmedicine website! October 6, 2014 - MAPS issued a press release to announce its new phone app for consumers to use to better manage their healthcare. MAPS work to improve safety of care at transitions was featured in an article in the August 2014 issue of Minnesota Medicine. "Patient safety can be compromised at any time, but a disproportionate number of problems occur when patients are transitioning between care settings and care providers. Therefore, those trying to improve patient safety need to focus particular attention on times of transition. This article describes a public education campaign to change patients’ behaviors during those periods." Minneapolis MN (September 8, 2014)—The Minnesota Alliance for Patient Safety (MAPS) and the Wehrman Collaborative, LLC (WeCo), an accessibility testing organization, announced today that a MAPS patient education website has been granted a limited right of use of WeCo’s Access Approved® logo. This recognition illustrates that MAPS meets WeCo’s user-experience standards of accessibility for all people, regardless of their disability. Please click here to see the complete press release. In Fall 2013, MAPS started work on a grant to improve the safety of care at transitions through better engagement of patients, residents, families and consumers. This grant came to MAPS through an expansion of MHA's Hospital Engagement Network (HEN) grant from CMS. This initiative's goal is to identify effective ways to engage health care consumers in taking a more active and informed role in the management of their health care transitions to reduce potential harm. One of the most potentially harmful legs of the health care journey remains at care transitions - moving from one care setting to another. The grant work is focusing on how to activate patients so that they can prevent harm at transitions based on medication reconciliation, communicating test results, understanding the warning signs that a medical condition is worsening, and completing next steps or follow-up appointments. MAPS, along with its member organizations, is overseeing the project and engaging local subcontractors to accomplish the proposed work. The initiative has two phases. The first was the development of a tool that patients will use to guide a safe care transition. In the second phase, MAPS is seeking to educate consumers on the importance of playing an active role in their health care and evaluate the effectiveness of the messages and tools developed in Phase one. Phase two is well underway and the progress is exciting! Findings from Phase one consumer research revealed both men and women are willing to accept leadership for their own health care. They may approach it in different ways but both agreed upon the importance of their roles. After 500 hours of consumer interviews, the group of respondents provided recommendations for tools that would help them avoid harm at transitions of care. To test the impact of the tools recommended by the consumers, several pilot sites will begin distributing a packet to participants during a time of transition. The packets will include a one page explanation of the folder contents, a note tablet, a "refrigerator" magnet, and a pen. About a month after the transition, a survey will be sent by the MAPS evaluation subcontractor asking participants about the use and helpfulness of the packet. A link to the one page explanation of the folder contents is below. As the patient safety movement builds, so does the recognition of the importance of safety across ALL care settings. Patients frequently move from one care setting to another, yet industry standards for how to best transition a patient are only emerging. Inefficient transitions can create waste and additional costs and are the focus of many initiatives across the country. It is precisely this reason that MAPS wants to ensure that the voice of patient safety not be lost as more community standards begin to form. Accordingly, MAPS will create a patient engagement tool that will include the above critical pieces of information designed to activate patients so that they can prevent harm at transitions. It is MAPS' hope that providing consumers with a tool for any transition will change the expectation of patients and health care organizations, making critical information, communication and follow-up the norm. MAPS realizes that patient engagement tools have been produced in the past - when they are used, the results are encouraging, however for the most part patients remain sporadically engaged and not adequately activated regarding the steps they must take at every transition of care. MAPS feels that this is because previous campaigns have been the critical "why" component. MAPS proposes to make the case for “why” patients need to engage and work with patients to identify a set of simple, universally applicable information to be utilized at every care transition.